The cache is a traditional cache with everything what is needed. The cache is not big enough for big trading items. Sorry. During the week there may be several students around, specially in summer. The site of the settlement was pointed out by economical and geographical circumstances. Even at the Roman times, it was a military post named Ad Flexum. After the Mongol invasion of Hungary the Óvár fortress was strengthened and then the importance of the civil setting beside the fortress increased, too. It obtained the municipal and staple right in 1354. At the days of Turkish rule the Turkish armies marching against Vienna ransacked the town several times, but later its importance decreased. Moson and Magyaróvár became united 1939, it has 31.000 inhabitants at present. The castle was founded in the second half of the 13. century. 1273 already the Czech King Ottokar II. invaded the castle but kept it just for several years. Some years later the castle was conquered by the Austrian earl Albert, but king András III. fought it back for the Köszegi famlily. 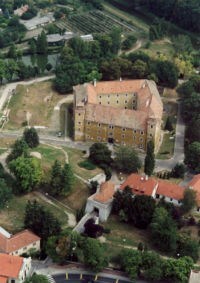 1323 The Köszegi family felt in to disgrace due to some rebellion and the castle was given to the queen. In the coming centuries the castle change the ownership several times between the Austrian and Hungarian royalties. Even the Turkish invaders owned it twice, but the castle was abandoned to them without fight. 1809 the castle was taken over by Napoleon. 1830 most of the outer parts of the castle had been demolished. In 1818 Albert Casimir, the Duke of Saxon-Teschen, son in law of Mary-Theresa founded a school for agrarian higher education. 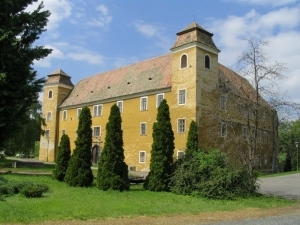 Its legal successor, the West Hungarian University with Agricultural Fakulty, is to be found in the building of the castle up to this time. In winter you should take your ice skate with you. Next to the castle is a small lake which is often frozen in winter. If you like to rate the cache I'm happy if you use GCvote. Please tell your true opinion about the cache in the log. If you do not like something, please write it down. I'll see what will be possible to do it better. Maybe you have an idea to improve too :-). Rira lbhat puvyqera pbhyq ernpu vg.